As St Vincent and the Grenadines prepared for Independence 27 years ago the hills of the Marriaqua Valley were covered with green gold – the omnipresent banana plantation – source of livelihoods, employment and sustenance for many – a sharp contrast with what obtains today. In Greggs and Lauders farmers who had taken over estate lands were beginning to learn what neighbours in Marriaqua had enjoyed for years. Theirs was the new taste of the power of banana and its weekly income to provide education for children; put food on the table; and clothing on their backs. Spirits flowed in the rum shops and there were dreams of a better life for wife, child, neighbour, concubine or nation. From New Prospect to Biabou to Union to Colonaire to Langley Park and Orange Hill, small farm agriculture jostled for space with estates that dominated the landscape on the Windward side of the country. Here sugarcane, arrowroot, cassava, banana and cattle, struggled for space while providing employment and livelihood choices for thousands. 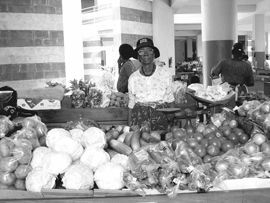 On the Leeward side, estates mixed in with small to medium sized farms provided its own sets of challenges and promises for owners, workers and those who had a stake in a strong and vibrant agricultural industry. The traditional “fish cars”, often rescued from a virtual dung heap by an enterprising fish vendor, traveled through quiet village roads and hamlets calling all and sundry with the rousing echo of the conch shell. Sometimes the fish car vendor is upstaged by the village fisher woman with bamboo basket on head, seeking her own fortune, bread on her table and clothes on the back. As we struggled to learn the words of the new national anthem “Our Faith Will See Us Through” I often struggled to hop onto the banana truck at the Geest Weighbridge with books in hand trying to save a dollar so I could come again next day to “Town School”. Secondary education for the children of many farmers was a luxury reserved for the very bright or those who could be spared the livelihood task of joining family and friend to work for the daily wage. Marijuana and cocaine were words known only to the enterprising reader or the sophisticated urban dweller for whom it was fun and games. Nowhere were they the source of guns and dreams of elaborate houses and SUVs. Nowhere did they compete with ordinary farming folk for a labour supply or choice of livelihood. Everywhere in 1979 agriculture in SVG was important for food, shelter, clothing and healthy communities. Everywhere, agriculture was a challenging but important means of livelihood and development as a nation. Everywhere it helped to build character and made many realize that success in life is about working hard for dreams and goals. In 1979 love of agriculture and its possibilities inspired a commitment for me to work towards the development of country through what has always been the basic industry worldwide. Twenty-seven years after Independence, the hills of the Marriaqua Valley are adorned by the occasional banana farm, whether well kept or otherwise. Today dasheen plots dot the same hillsides, as farmers and workers, with fork in hand and little regard for maintaining precious topsoil, grow dasheen, not for the family pot, but for sale to traffickers and NPL. In Greggs and Lauders, banana farms that once built wall houses and bought pickup trucks, have given way to dasheen fields replanted every nine months. Today, the steadfast banana farmer, in the face of rising production costs, and WTO/EU-Banana-Regime-eroded markets and prices, competes with the ganja farmer for the dwindling few who are prepared to provide labour for the agricultural industry. Today an agricultural sector, abandoned even by the financial institutions that benefited most from the foreign exchange that sustained imports from cars to Kentucky Fried Chicken, languishes. Financial institutions extract the highest interest and the most stringent conditions from persons prepared to invest in new possibilities in the basic industry. Today “agricultural diversification programmes” managed by professionals like myself are at the forefront of the anger and frustrations of farmers and others who still pursue the dreams of a better life for families and rural communities. A promise of assistance from the Agricultural Diversification Programmes Investment Unit (ADPIU) with its attendant strictures and conditionalities becomes fertile ground for vexations of those for whom the “money nah flow fast enough” to those whose livelihood dreams it is expected to meet. Today, agriculture’s pride of place (7.7 per cent) in the GDP statistics (at factor cost 2005) is replaced by tourist attractions (real value unclear), financial services (8.6 per cent), transport and communications booms (19.1 per cent fueled by the ever present cell phone, motor car and minivan), wholesale and retail (19.5 per cent), construction (13.3 per cent), government services (19.7 per cent), declining manufacturing (5.5 per cent) and electricity/water (6.7 per cent). Statistics like these, dry though they be, are at the center of our economic policymaking. Many have been our pronouncements over 27 years about the death of agriculture. So self-fulfilling are these pronouncements, that farmers who have money to pay labour find it extremely difficult to meet the urgent demand to harvest bananas on a Sunday for export to the EU. So telling has been the talk on agriculture that we increasingly abandon our agriculture for that produced in countries which use their foreign policy muscles to protect their own agriculture to the death. Diabetes and hypertension, driven by imported tastes and products, have become major national health concerns and issues. In our country, as economists we have used our declining agriculture GDP contributions as indicators of development. These values have been often used to justify elaborate investment strategies whether of offshore financial excursions or tourist visions. Through it all we struggle to devise rural transformation and adjustment schemes to fill the breach. Our rural and urban communities shudder under the weight of increasing social deviance. Could there be a link between the state of our agriculture and the quality of life in our rural and urban centers? Is there a spiritual dimension that has been lost to us as a people when we have turned our eyes from our agriculture? As our Anthem says, “Our faith will see us through” but the Bible also says “Faith without works is Dead”.